A Dark View Of Russia From U.S. NATO Commander Army Gen. Curtis Scaparrotti warns Russia's objective is to "undermine NATO solidarity and fracture the rules-based international order." His rhetoric is much harsher than President Trump's. 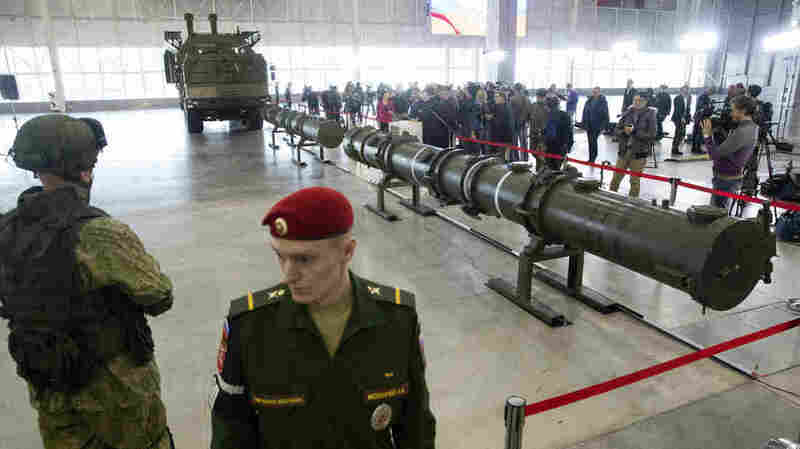 Russian military officers stand by as the 9M729, center, its launcher, left, and the 9M728, right, land-based cruise missiles are displayed in Kubinka outside Moscow, in January. The Russian military rolled out its new missile and spelled out its specifications, seeking to dispel the U.S. claim that the weapon violates the INF Treaty. If Trump's aim was to avoid confrontation with a superpower whose nuclear arsenal rivals that of the U.S., or more personally, not to to antagonize an iron-fisted ruler who may or may not have damning information to spill on Trump, his top military commander in Europe does not seem to have gotten the memo. Appearing this week before the Senate Armed Services Committee, NATO Supreme Allied Commander Europe Gen. Curtis Scaparrotti sounded an alarm about Russia's aims in the lands west of its border with Europe. "Russia is a long-term, strategic competitor that wants to advance its own objectives at the expense of U.S. prosperity and security," Scaparrotti, who also leads the U.S. European Command, told the panel. "In pursuit of its objectives, Moscow seeks to assert its influence over nations along its periphery, undermine NATO solidarity and fracture the rules-based international order," he said. It was likely Scaparrotti's last appearance in uniform before the committee. He's slated to retire later this year from the two command posts he's held in Europe since President Obama appointed him three years ago. During the four-star general's leadership, the U.S. has further expanded a military deployment in Europe that's been growing since Russia's 2014 annexation of Crimea. "I humbly represent over 68,000 brave and dedicated men and women who are forward-deployed or stationed in the European theater of operations," he said in prepared remarks. That force, he suggested, is nonetheless inadequate. "I'm not comfortable yet with the deterrent posture that we have in Europe," Scaparrotti told the senators. "I have shortfalls in our land component...and in our maritime component," he added, noting he's requested that two naval destroyers be added to the four currently stationed at the U.S. naval base in Rota, Spain. "In light of Russia's modernizing, increasingly aggressive force posture," Scaparrotti declared, "(the U.S. European Command) recommends augmenting our assigned and rotational forces to enhance our deterrence posture." And while Scaparrotti asserted the U.S. still maintains military superiority over Russia, he suggested that may not be the case in the future. "Evolving Russian capabilities," he warned, "threaten to erode our competitive military advantage, challenge our ability to operate uncontested in all domains and diminish our ability to deter Russian aggression." At another hearing this week, Congress got a darker estimate of who's up and who's down in the revived Great Powers competition along Russia's western frontier. "Understand that there's no place today on the NATO-Russia border where Russia does not have military superiority," former NATO nuclear policy chairman and George W. Bush administration special adviser Franklin Miller told the House Armed Services Committee, adding, "I think that the Russian leadership looks at nuclear war differently than we do." Adding to Cold War-reminiscent tensions, Russian Foreign Minister Sergei Lavrov declared this week that Moscow reserves the right to deploy missiles banned by the 1987 Intermediate-Range Nuclear Forces Treaty, which applies to all U.S. and Russian missiles that can fly between 500 and 5,500 kilometers. That followed the Trump administration's notification last month that the U.S. was withdrawing from the INF Treaty. Each side accuses the other of having violated the pact signed by President Ronald Reagan and Soviet leader Mikhail Gorbachev. The collapse of the arms control accord has been sharply criticized by congressional Democrats, who contend its demise will likely make a bad situation even worse. "What is our plan to prevent Russia from building more INF Treaty-prohibited missiles in the absence of the treaty?" asked committee member and Democratic presidential candidate Elizabeth Warren of Massachusetts. "Do we have a plan here?" "I don't know that we have a plan today," Scaparrotti replied. "I know we're working on what we think that plan might be." In the end, Scaparrotti told lawmakers, the continued cohesion of NATO — a military alliance which Trump has frequently criticized — may provide the best defense against what he termed a "revisionist" Russia. "When you can combine 29 nations with their elements of power in response to Russia's," the 63-year-old Army general told the panel, "it's a slam-dunk. There's no doubt that we can handle this and they'll be deterred, but we've got to work together."